One of the best ways to study the state of Georgian Bay is to look at the fish community, and specifically whether each species of fish is naturally reproducing – or if the population is declining. Fish are a useful indicator of aquatic ecosystem health because they reflect changes in nutrients, prey availability, water quality and habitat. Dozens of studies over decades, give us a snapshot of the health of fish in the Bay. 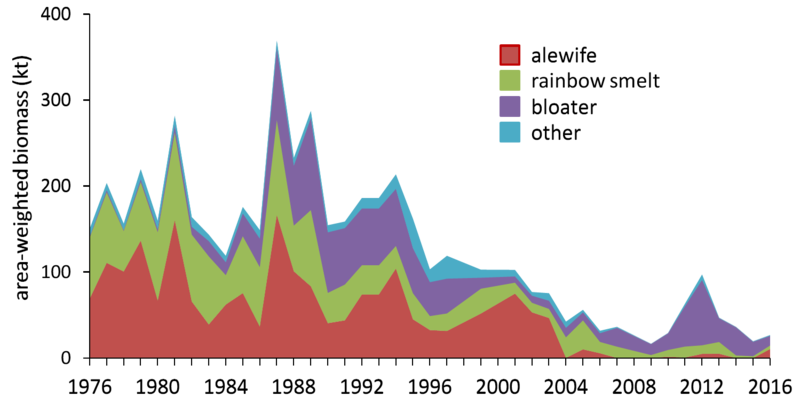 Historically, prey fish in Georgian Bay were quite diverse. In offshore waters, there was a mix of native prey fish such as the deepwater cisco (e.g., bloater, shortjaw, shortnose, Blackfin, Kiyi), sculpin, lake herring, ninespine stickleback and trout-perch. In nearshore waters, species like the spottail shiner, emerald shiner, young whitefish, sucker species (e.g., common white sucker) and yellow perch were important in the diet of predators like walleye, pike and muskie. Native prey was in balance with native predators. Over time, with over-harvest of some species, introductions of new fish, stocking for anglers, and the profound changes brought by invasive species, that system fell out of balance. Zebra and quagga mussels have reduced nutrients, and in turn the availability of food at every level of the food web. The only substantial native prey species remaining in offshore waters is the deepwater cisco species, known as the bloater. Rainbow smelt and up until recently alewife, both non-native species, have been prominent offshore prey fish since the 1930s. Overall, prey fish diversity and abundance have declined, creating a food web imbalance where there is less food energy in the system for predators. These changes in offshore food webs have affected species like lake trout and lake whitefish. Both species were harvested by large commercial fisheries historically in parts of eastern Georgian Bay. The rehabilitation of lake trout in Parry Sound was a major success story but restoration of lake trout elsewhere is still not completed. After reaching historic highs in the late 1990s, whitefish abundance has declined substantially, the causes of which are still being investigated. In eastern Georgian Bay, smallmouth bass are one of the more abundant species, yet they too are affected by human activities, including harvesting and habitat disturbances. 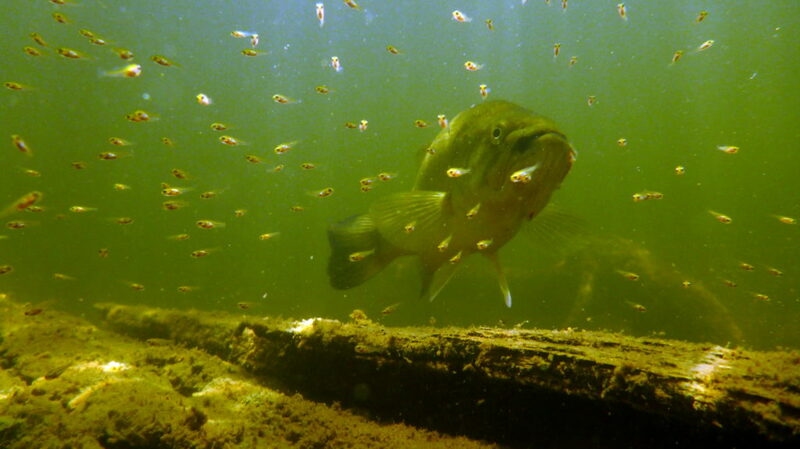 Warming temperatures have improved growth and survival but changing water levels and new invasive species like round goby, readily consumed by bass but also an effective predator on bass eggs and fry, make it difficult to predict future abundance. The northern pike and muskellunge are top predators that live in nearshore waters and secluded bays. They are reliant on coastal wetlands for successful spawning and nursery habitat and return to the same spawning location each year – so they are sensitive to environmental changes and especially loss of wetlands. Research shows that most pike and muskie populations in eastern Georgian Bay and the North Channel appear to be unchanging, indicating a naturally reproducing, sustainable population. But populations in southern Georgian Bay may be deteriorating. Further studies will be needed to determine each of these trends. If these species are to remain self-sustaining, then preserving coastal wetlands is a priority. At one time, walleye were plentiful and Georgian Bay became known for the size of its fish. However, since the early 1900s, most walleye stocks have declined due to overexploitation, human alteration of rivers and waterways and the introduction of invasive species. Dams in rivers change the flow of water, and high water can threaten eggs by washing them away, while low water can cause them to dry out. In the Moon River, for example, where walleye spawning runs used to number over 30,000 fish, these numbers have dropped more recently to only several hundred. 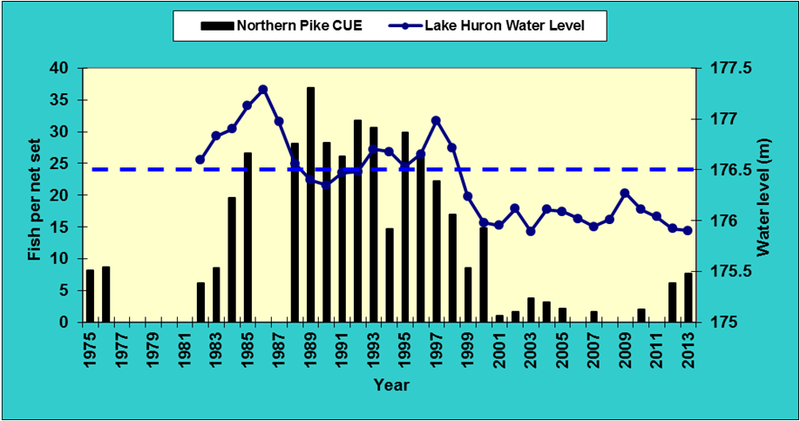 Declines in all major native species—lake trout, walleye, muskellunge, pike and others—indicate that the aquatic system has changed significantly in the past few decades. Despite restocking efforts and some habitat restoration work, the years of stress from invasive species, habitat loss and now loss of nutrients create an enormous challenge for sustaining fish populations.